Firstie Favorites: Hip Hip Hooray! It's Almost the HUNDREDTH Day! Click this photo for the FREE projectable image! In my last post, I wrote about my New Years Resolution of NOT neglecting my blog!! With the help of a "cold day" off of school, I am posting for the second time this week!! My second New Years Resolution is to plan ahead a little more. This is my third year of teaching and I am ready to stop flying by the seat of my pants, especially when it comes to seasonal/time sensitive activities and units!! Therefore, I am taking today to prep for the 100th Day of School, which is still a whopping 22 more school days away for us! In this post, I'll share many of my own ideas/creations/past projects as well and some new ideas that I found today and want to try out this year! Nothing beats a cold day/work day at home! I could get used to this! Okay, let's begin with some fun door displays that I found while perusing Pinterest today! Here's my favorite that I plan to put up this year!! Last year, I began the day with making 100th day crowns. Students color 100 objects within the #100 and then add up all of the objects to make sure that it equals 100. The studenst cut around the number and we staple them to construction paper strips to make crowns! The crowns that I make are from an old copy that I got from my cooperating teacher when I was student teaching. However, a very similar crown can be downloaded for FREE from TpT. Enjoy this printable from Mrs. Ahren's store. My kids wore these all day and loved it!! Simple and fun!! 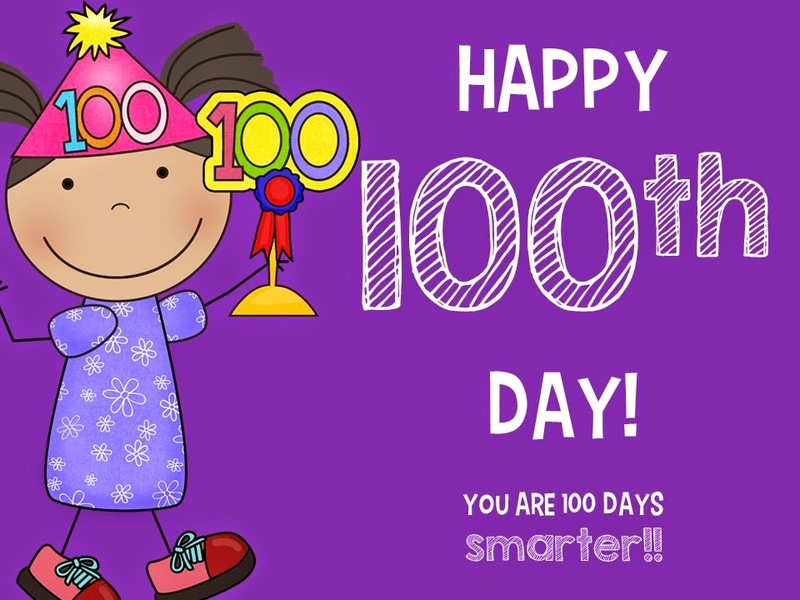 I love having the kids complete interactive math and literacy activities for the 100th Day! Here are some of the activities they will complete throughout the day!! 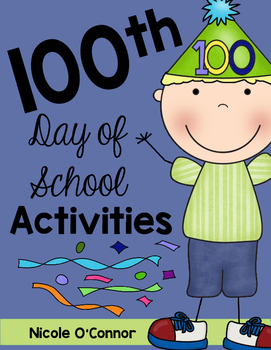 All of these activities can be found in my TpT store: Hundredth Day of School FUN! We focus heavily on word families during our literacy block. 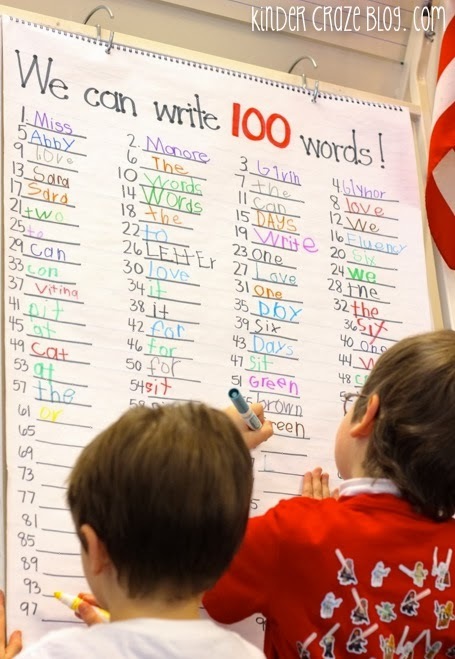 One of the students' 100th Day Challenges is writing 100 word family words!! Most of them are short vowel word families because that's what we focus on for the first half of the year. They work in partners or small groups. It's awesome to see how many words they can write now!! Bless their little learning hearts! Found this adorable chart idea on Pinterest today! Love this idea from KinderCraze! Plan to do this after the kids have written their word family words! We also write about what the world will look like in 100 years! 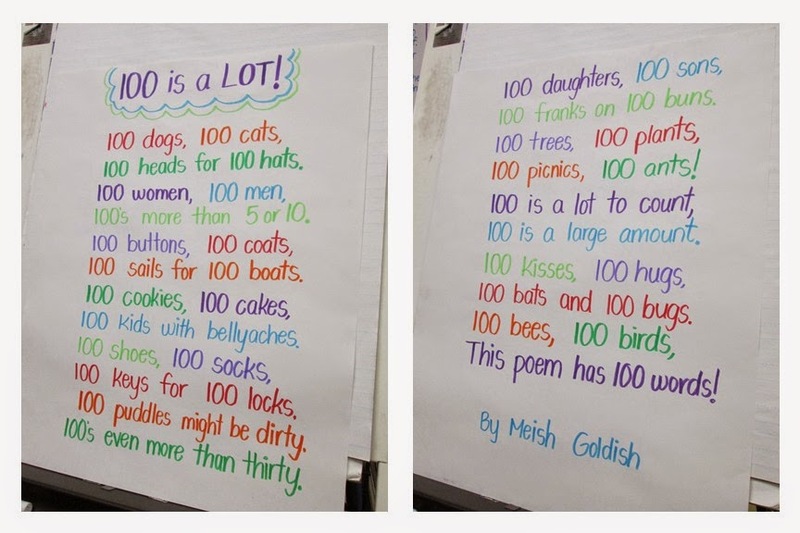 We also read my favorite 100th Day Poem and funny 100th day books! #sorrynotsorry. No cute drawings. I'm not an artist. Just a few of my favorites! I especially love the Robin Hill School series because the teacher's name is Mrs. Connor, which I conveniently change to Mrs. O'Connor. The kids always get the giggles! 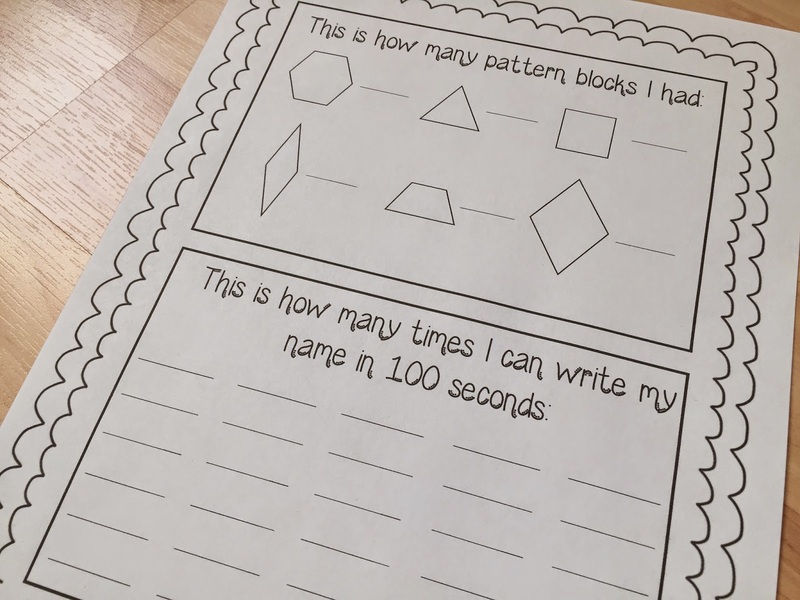 I have my students complete these math activities in centers. Students rotate to each center throughout the math block! Center 1: The kids test out some probability with 100 dice rolls and 100 coin flips! Also a great way to practice making tally marks in an organized fashion! I dig out my fun dice for the 100th day!! It's amazing how motivating new dice can be! Center 2: I CAN do 100 math problems! Center 3: Sorting a bag of 100 pattern blocks and recording your findings! You know you all have these!! An oldie but a goodie, as my mother would say! 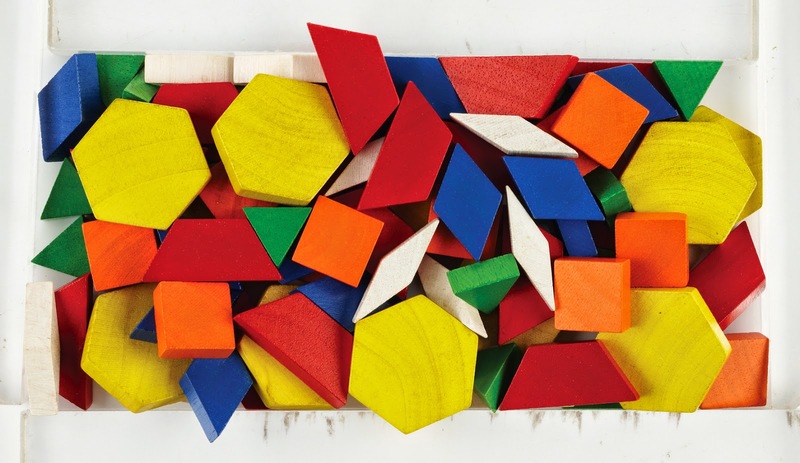 Divide your blocks into bags of 100! Some of the sorting methods from last year! Not sure that this method is the most effective! But boy, did he have fun! Here are a another idea that I may add to the mix this year from Tip Junkie! Okay! Two more things that made our day complete last year! The first was our 100th Day TENS FRAMES SNACKS! This was a huge hit! Grab a freebie of this sheet here! I had all of the snacks on the back table. Students went through the line with a cup and counted out ten of each snack item. Then, they organized the snacks in the tens frames at their desks. Finally, our 100th Day of School Art Project! Got this fun and easy idea from The First Grade Parade. Give each student cut outs of the number, 100, and they create a picture out of it! Loved to see their creativity shine with this one! Well, that's all I have folks! Can't wait to do all of this again this year and try out my new finds! Thanks for this fun blog post! Tons of great ideas!!! This is the best 100th day of school for sure, very creative ideas! I cannot wait to try the Snacks, the kids are going to have a blast. Thanks!! !